The Venerable Tenzin Priyadarshi is the founding president and CEO of the Dalai Lama Center for Ethics and Transformative Values at MIT. He undertook both monastic studies (he was ordained by His Holiness the Dalai Lama) and a secular education (he earned a graduate degree in Comparative Philosophy of Religion from Harvard) — and the combination is reflected in his innovative work and worldview. 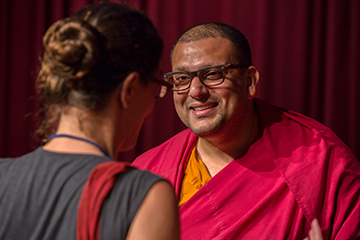 Like the concept of the middle path in Buddhism, Tenzin Priyadarshi appreciates the logical, analytical, and spiritual education he’s received — and which he now passes on. 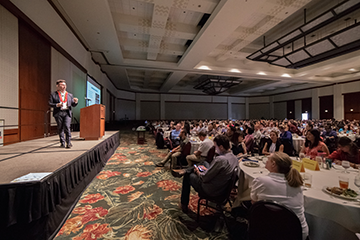 He spoke at the Schools of the Future 2016 conference in Honolulu about re-thinking the role of educators. “If teachers are not facilitators, they are obstacles,” he said. At the risk of sounding like a heretic to an audience of teachers, Tenzin cited examples in Tibet and India where online learning is the better option for certain skills. But Tenzin was quick to ask, “Even if students can sometimes learn better with digital tools, how do they become good human beings? Are these things even teachable?” Ironically, “I’m just a human being” is a common expression used when someone doesn’t achieve a task or goal, as if being human is some kind of weakness. Tenzin is working to create a platform for teaching ethics in school, because people don’t become good human beings by magic; they, like athletes and scientists who train to become experts, need to learn and practice. 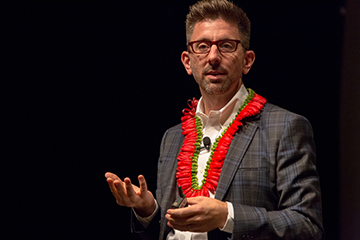 To see a video of his presentation at the 2016 Schools of the Future Conference, click here.